The perfect gift for the friend who needs a little cheer! 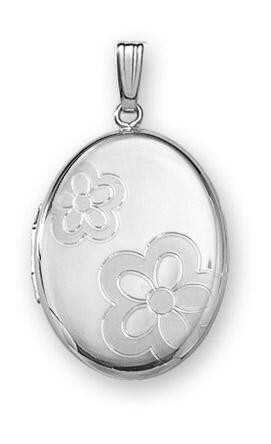 Oval Sterling Silver locket has flower motifs reminiscent of the 60's embossed on the front. Measures approx. 5/8" across and 3/4" long. The back is plain and perfect for engraving. Comes boxed with matching Sterling 18"chain. Made in the USA, lifetime warranty. The perfect gift for the friend who needs a little cheer! 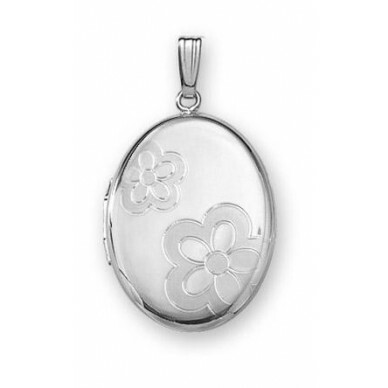 Oval Sterling Silver locket has flower motifs reminiscent of the 60's embossed on the front. Measures approx.